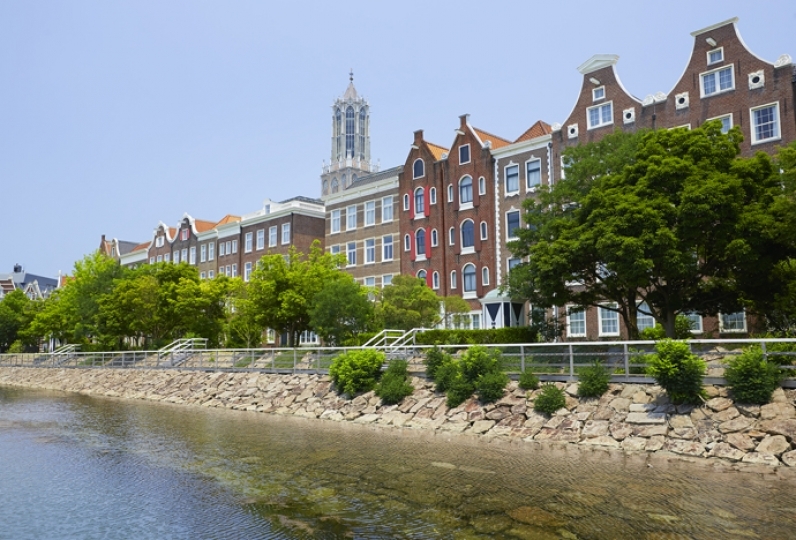 Huis Ten Bosch has remodeled the town view of Holland. It is as if you've flown into a different country. 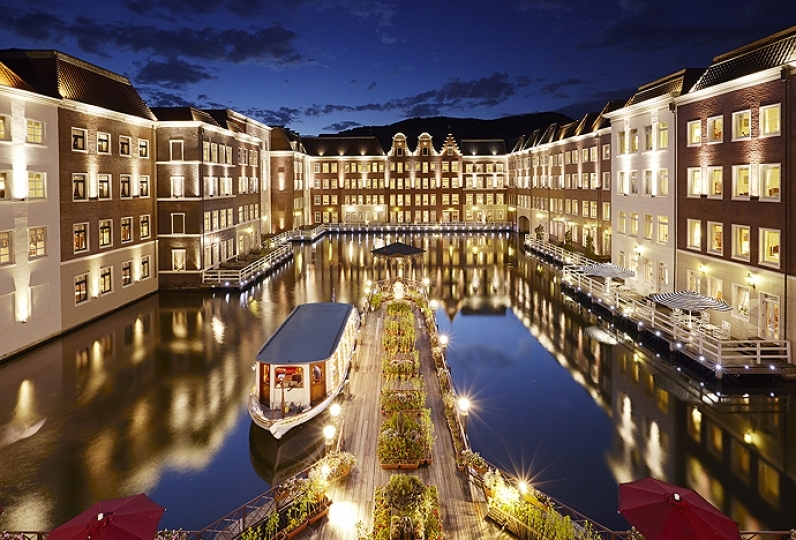 The only Waterfront Hotel has opened at Huis Ten Bosch. In front of the hotel is the shimmering ocean. You will be able to enjoy the fireworks event that is held throughout the year in the rooms that are on the side of the ocean. Enjoy the different rooms in the hotel, like the rooms on the side of the forest where the air is very clear, rooms that are designed like European towns. All of them have different sceneries and ambience. In addition, there are a variety of room types as well: King, Twin, Triple & Family. The fantastic view of Omura Bay will start a refreshing morning. The restaurant by the beach will provide you some great meals that you can only enjoy here. Enjoy Japanese Western Breakfast Buffet with more than 60 types of dishes, including the "Omelet" and "Pancakes" that are cooked right in front of you. I think it is the best way to enjoy Huis Ten Bosch. I thought that the room of the loft twin was relaxed and the bathroom was quite large. Breakfast was buffet style and omelet of live kitchen was delicious. I didn't have many opportunities to interact with the staff, but I felt somehow unfriendly. It is not to say that the attitude is bad, but it is a manual and ordinary feeling. I think that the accommodation purpose for enjoying Huis Ten Bosch is totally OK. I think it is the most famous place in Huis Ten Bosch. Europe is gorgeous and nice, but I like it from a long time also in position. There is nothing extra, but it's like Huis Ten Bosch, and it is unbearable to love Huis Ten Bosch. After staying at Huisten Bosch for 1 day, we stayed as it was, so it was conditionally good. Facilities facilities were also satisfying, but doubt remained in correspondence of staff. I heard the park, how to get on the bus outside the park, and the explanation of the ticket, but I think that it was incomprehensive manual explanation that was general, but I was sorry that it did not feel like receiving the service is. Is it a land pattern? I'm happy if you understand what you are having trouble with, why you asked. Also, when leaving your luggage with Takkyubin, it was an explanation that you can not treat your baggage with a gum tape, but leave it to the hotel. I feel bad that the contents are seen, and I thought what to do if the contents were gone. Just to be sure, it is not a staff member of a few foreigners. It is a question about the doubt to the facility and the correspondence of the Japanese staff. You will be able to see the Omura Bay from the glass walls of the restaurant. Enjoy a laid back breakfast while looking out at the fantastic morning glow. More than 60 seasonal Japanese and Western dishes will be laid out in the restaurant. Feel free to pick out your favorite dishes. We recommend the omelet that is cooked by our chef in front of you, healthy fresh fruit juices and natural yeast bread. Please enjoy the various dishes cooked by seasonal ingredients, including local Kyushu dishes. Enjoy a cup of tea or coffee with sweets of the month. "Simply Refreshing" Tea Clipper will provide you a refreshing moment in the white, open café where you can see the Omura Bay. A chic, warm and relaxing bar with heavy wood grain interior. The lady bartender is at your service to offer some elegant time at the bar counter. There are no public baths at our hotel. We will offer our guests a peaceful relaxing time with our massage techniques and the plentiful aroma oil. Please use the "Parking lot for hotel guests" at the entrance of Huis Ten Bosch. Please bring the parking ticket with you to the hotel. 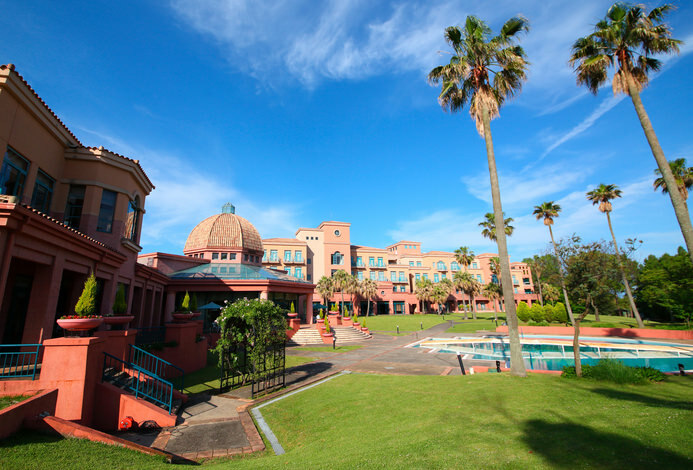 If you give in your bags at the "Baggage Drop off Area for hotel guests" at the entrance of Huis Ten Bosch, we will bring your baggage to the hotel. You may use the shuttle bus to the hotel from the "Baggage Drop Off Area for hotel guests". You may enter the area which requires tickets from the "Harbor Gate" which is a 5 minute walk away from the hotel. If you have your ticket with you, you may come and go from the hotel to the park. Please feel free to rest at the hotel. 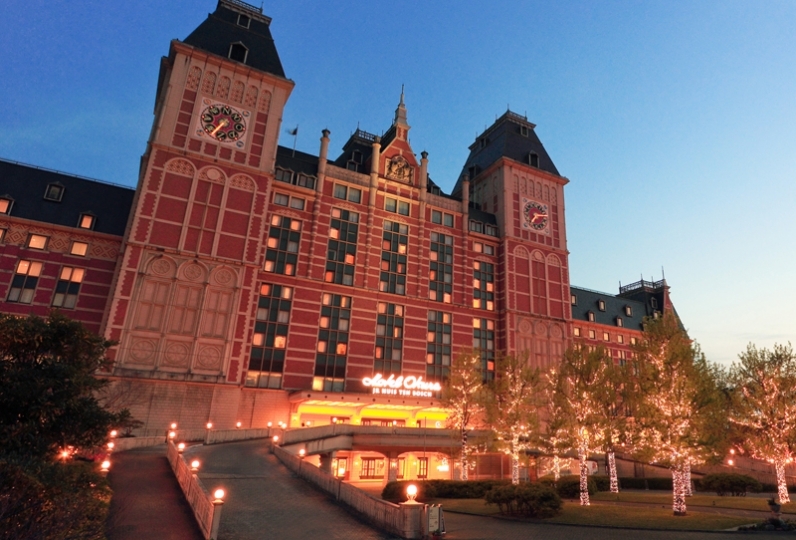 Our hotel is located within Huis Ten Bosch premies. However, it is located in the Harbor Zone which does not require any tickets. If you would like to go inside Huis Ten Bosch, you will need to purchase a ticket. Please park at the "Parking lot for Hotel Guests" at the entrance of Huis Ten Bosch. Please do not forget to bring your parking ticket to the hotel. For 1 adult, one children will be allowed to share bedding. If 2 adults are staying in the Semi-double room, we do not allow children to stay with them.